The orange wall with black little spots is just like the 60s’ skirt, and also like the cute and humorous candy paper. This innovative “caramel orange” space creates young and trendy atmosphere with fun and chic touch. 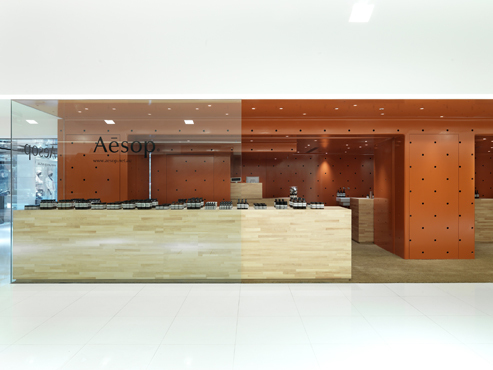 Deriving from the humanity concern and minimalist style of Australian beauty brand Aesop, the showroom is covered by continuous orange slab from the wall to the ceiling, and the holes lining up in rhombus appear in black color form a very beautiful pattern. The structural pillars of the space are concealed skillfully, transforming the broken space into a visually strong and complete box-shape. Besides, the lighting is placed irregularly in the hole on the ceiling, just like the star shining in the room. The wooden display shelf and the palm tree fiber carpet add the natural breeze into the space, and the warm color gives the passer-by friendly and cordial greeting. The display shelf also functions as storage space. The products placed in the half-open storage shelf also create different display effect. The white basin in the back is another visual focus, resonating with the bright color in the space. 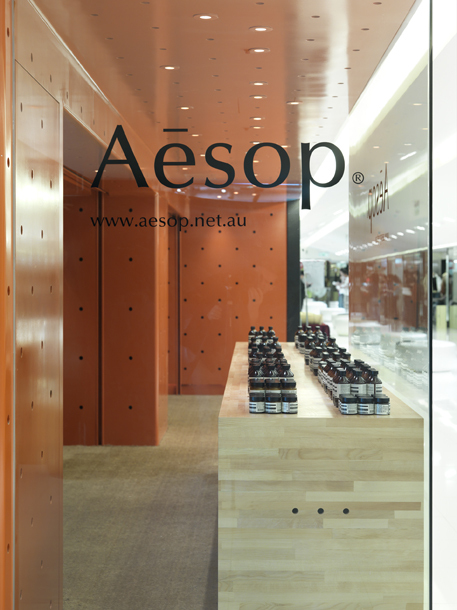 Without extra decoration, the brown bottles lining up on the shelf reveal Aesop aesthetics: using the product itself to tell the story. 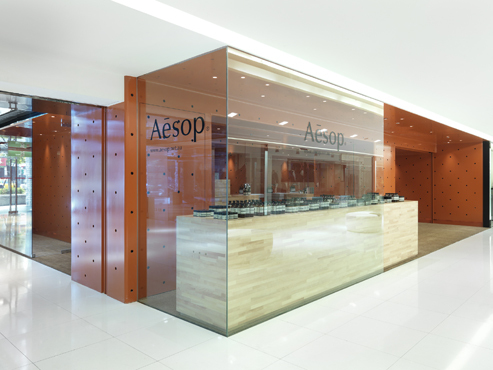 Just like the core spirit of Aesop, the “caramel orange” space utilize beautiful to vocabulary to create new space language, and demonstrate the Aesop aesthetics with color and material.